Hello there. Hope you had a nice long weekend. Mine was good…just a little of this and a little of that. My son starts back to school today, so I’m looking forward to having a routine and getting back into blogging a bit more. I always feel like I’m going every which way during the summer, don’t you? I’m joining up with Kathleen’s White Wednesday and also Kim Klassen’s Texture Tuesday since I haven’t linked up to a photo party in awhile. I’d like to take part in more photo challenges to improve my photography and editing skills…there’s so much to learn and not enough time. All of these photos have three layers of Kim’s cracker jack texture in hue, darken and soft light. I also used the milk and honey action from Florabella. I’ve never tried using hue to adjust a texture before, soft light is my usual mode, but I thought I’d mix it up a little today. I like how everything came out with a nice crackly vintage look. The first and last photos are my favorites. So beautiful and peaceful! I am very impressed with your ability to throw together some things and make a beautiful photo with it! I love them all, but the second one all white is really soothing to me! This is not beautiful..is stunning! !Whata wonderful pics !Gorgeous photos! Have a great week! I agree with you….both the first and last photos are absolutely stunning! They would look lovely on a canvas or framed in a vintage white frame! Oh my…your photos just get better and better…so very lovely! Just BEAUTIFUL, Tricia! You really have an eye for composition and color! every shot is gorgeous Tricia, the textures work so well with all your bits and bobs absolutely beautiful. These are all so beautiful and soft! Hi Tricia! First I have to tell you how stunning and absolutely beautiful your photos are! so I really miss stopping by your blog and seeing what you've up to…. I can't wait to catch up on your posts! August really had me going in every direction! I hope you had a wonderful end to your summer! 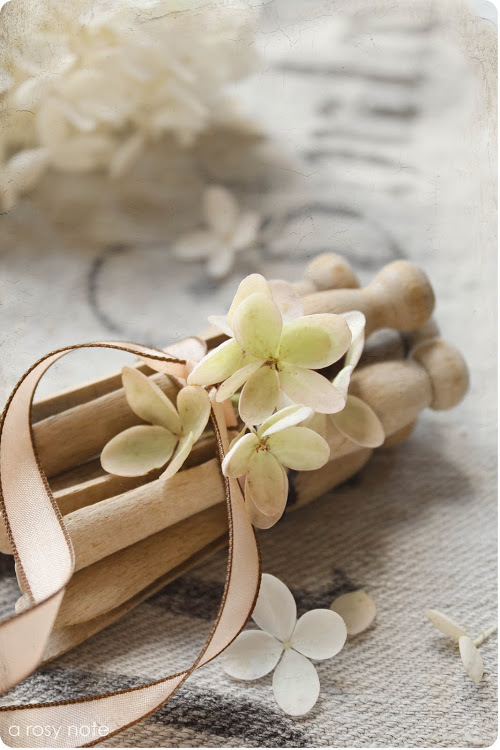 the combination of clothespins and hydrangeas gives such a nostalgic feeling… perfect editing! What a wonderful collection of photo's, I love them all. Such simplicity and beauty. 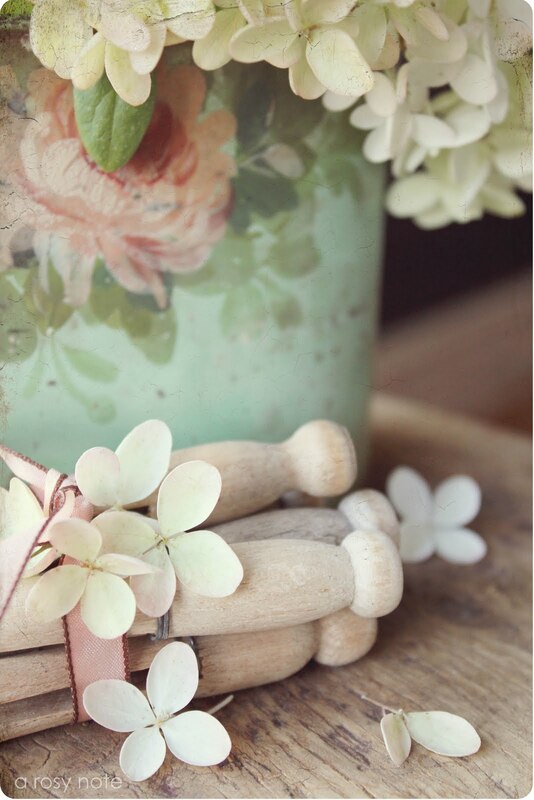 Beautiful post…love the soft tones! What a sweet combination. So pure. Gorgeous composition, so soft, with the vintage look. Love them all. They are all stunning and so nicely composed..my favorite is the last with just a little touch of color. Your photographs are really lovely and I like your subtle use of texture to enhance them. They are truly special. The photos clearly show our feelings. I just love your style…….they are all my favoritie!!! So gorgeous and so vintage! Gorgeous as always. I have to agree with you, I think I love that last one the most. I am so behind on using Kim's textures, but I should have more time to play around with them now that my son is back in school. Your photos are beautiful! I especially love the one with the hydrangeas on the old book. Our kids have been back in school since the middle of August, yet I still feel like I'm going all the time. Stunning pictures. I'd buy a print of the one with the flowers/clothespins. Really gorgeous. Thanks for sharing the beauty, and have fun with your photography! Lovely photographs! The combination of those three elements is perfect! gorgeous girl. i am loving that crackerjack texture. need to check into that. have a great day. I am always in awe of your photos! I study them but can't seem to get mine even half as good! Love how you can just "throw things together" and have it all be so beautiful. I don't know how you could improve your photography. I wish I knew how to get gorgeous ones like yours. Tricia these are just gorgeous! So soft and I love the textures. Your photography is so gorgeous! I love the colors and textures so much. Beautiful and very stunning photos, I lake it! So pretty. Beautiful application of the textures and such soothing colors. Just lovely..your composition is always perfect! Tricia, your images are always so lovely, you must have a beautiful soul!! Tricia you always the most gorgeous way of photographing the simple things. I love it! I hope you are framing these!!! Are you kidding? you could teach a class on beautiful photography and use of textures as well as composition and still life photos – I adore your work! Gorgeous photos Tricia. I love the hydrangeas and the green pot in the last shot is so pretty! These are all breathtaking. My personal fave is the one of the hydrangeas on the book with a few stray blooms on the wooden table. Your photography style is so gorgeous. Beautiful photography. Love all of them. Your hydrangeas are gorgeous. Love the delicate look you captured. You always have the most beautiful still life photographs – your work is inspiring Rosy. Sorry that I don't get over here often enough to keep up to date on your posts but hopefully I'll have more time during the winter when the garden doesn't demand so much of my attention. Hi! Over from Texture Tuesday…your blog is fabulous! Your images are so beautiful! I'm loving my visit! so pretty!!! i have just been catching up with your bloggy and am so sorry to hear of the loss of your kitty. it is hard to lose a part of the family. also, i just love the series of pictures at the lake…your little girl is adorable and i just love her interest in the great outdoors. oh and i have the very same cowlick on my forehead as her!! all of your images are always so dreamy!!! I'm speechless – your compositions are fabulous! I really L O V E this pictures . Can I just say how amazing these are? and the 2nd one…should be blown up and hung! I like what you did with a few supposedly disparate elements. The pictures are lovely and they are great for the textures. Wow, I'm impressed! These are gorgeous. Hope you're having a great day, my friend! All of these are so beautiful. The elements though not really connected blend together to make pleasing shots. Love all of them. Sorry about the prior removal of a comment…had a big typo! Oh, such lovely images! Great arrangements, composition, lighting and processing! Truly, these are inspiring pictures. These are such beautiful photographs Tricia. Each composition is truly perfection! Your pictures are always so exquisite, to say the least!!! I love the rustic & natural look that these photos convey!!! So elegant…the texture added just enough vintage feel to them. Nice shots too. Simplicity at it's finest! Love them. Joined your blog following, love your images and style. Simple and elegant. Love the colors. I bet you could launch yourself as a 'real' photographer if you wanted. Your photos are really and truly outstanding – everything is perfect. Coming to your blog is like entering another, perfect world. I think these are some of your best yet. You are amazing! I would never have thought to photograph clothespins like that. You made the ordinary look just beautiful! Your photos are so beautiful! I love the teal colored pail with the clothespins. So lovely! Beautiful photos. Thanks for sharing. I am a happy new follower from White Wednesday. Just lovely! I am here through Texture Tuesday. I adore hydrangeas. The little bits and pieces you have added to them give such a vintage, romantic look. beautiful, I want to get photoshop and these beautiful editing tools!!!! Your images are stunning. All the elements come together so perfectly. Truly inspiring work. Your blog has always put me at ease in a very gentle way …Stunning photography as always and so much style !!! Came upon your blog by chance. 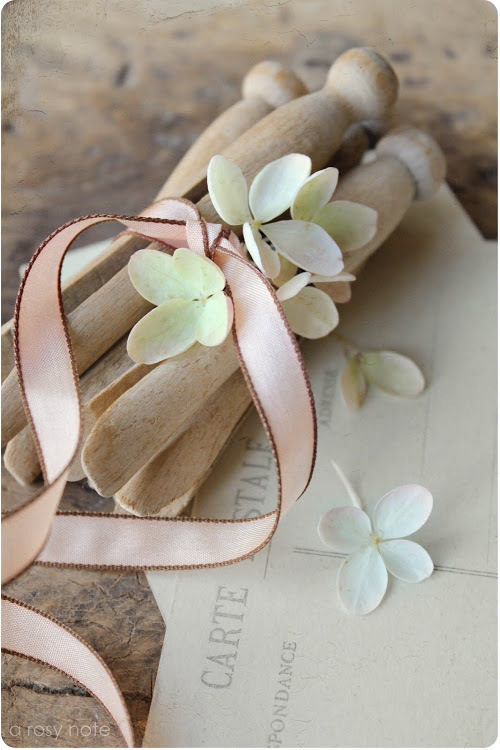 Who would EVER think to put old clothespins together with hydrangeas and get such a gorgeous combination! Wow — what a creative mind. Thank you for sharing! Simply gorgeous! Love everything about this post! Very pretty Tricia! My favorite is the one with the hydrangeas on the book! But really all just lovely! Hope you're having a wonderful week-end. it looks like you rocked the Texture Tuesdays challenge. the textures turned out lovely. WOW!! I am always speechless when I pop in here.. Your photos are so amazing..
Gorgeous pics, as always! 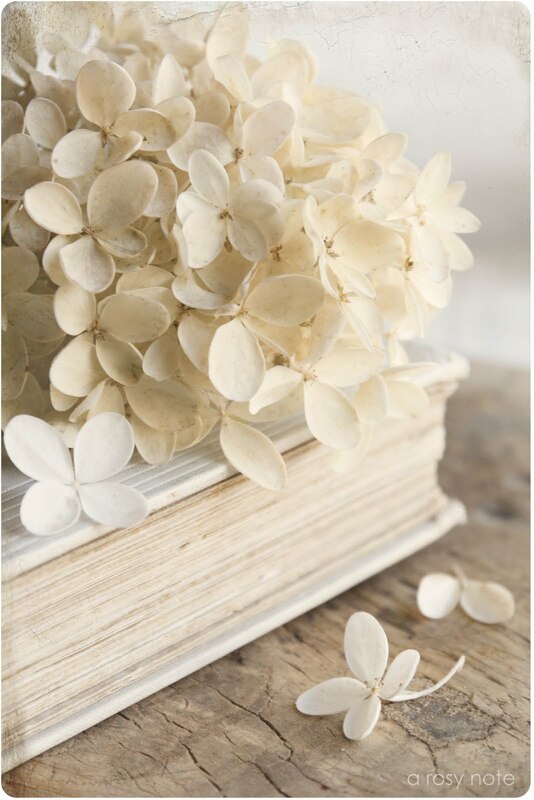 Love the hydrangeas on the book. There is a feeling and a heart in your pictures… Thank your for sharing them with us! Just found you via Pinterest. Beautiful hydrangeas and styling! Lovely!!!! !